Risk a bruised bum or two at iSkate, Gurgaon’s premier ice-skating rink. The 15,000 sq. ft. entertainment destination also includes a café, bar, karaoke room, and a state-of-the-art sound and light system. iSkate’s large rink can comfortably accommodate around 150, and boy, do you get a lot of variety of people in that number. While nervously strapping on your skates, you can see giggling kids zip by, struggling to keep balance while simultaneously hoping their friends will fall, along with a few young couples, as well as some families with cautious parents trying to keep their child upright. If it’s your first time and you’re anxious, don't worry, the rink has a couple of instructors on the ice at all times. The energy of the rink is also happy high, because of the in-house DJ who is consistently spinning a variety of tunes. Patrons pay by the session, and once the time is up, you can see the iSkate crew entering the rink to smooth the ice out for the next group. While you’re waiting, you can hit up their café for a quick snack, or get a drink at their bar on the upper level. You pay INR 499 per person on weekdays for an hour's session and INR 699 on the weekend. On the weekends, it can get a little too crowded to skate properly, so we say you opt for morning slots–even better if it's on a weekday (you'll probably get the whole rink to yourself). 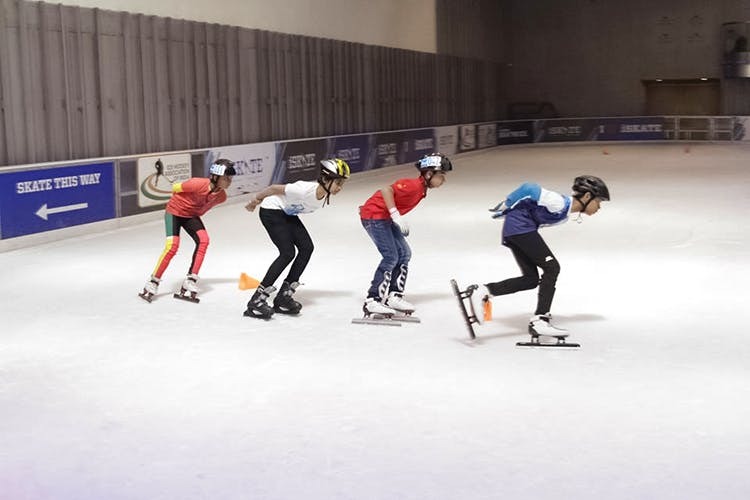 If you're serious about ice skating, they've even got basic classes on ice skating, figure skating, speed skating and ice hockey conducted by award winning athletes as well as O3 level trained professionals. These classes happen from Monday to Sunday and teaches skills such as reverse skating, jumps, spins and posture enhancement. Contact them if you'd like to enrol.